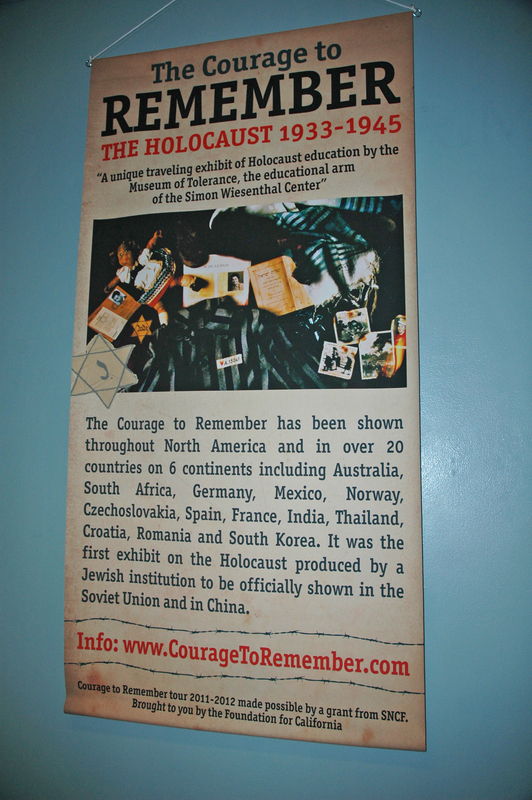 Sacramento is one of the few large cities in the world that does not have its own Holocaust Museum, but not to worry: a traveling exhibit called “The Courage to Remember” will be at California State University Sacramento until November 4, 2011. 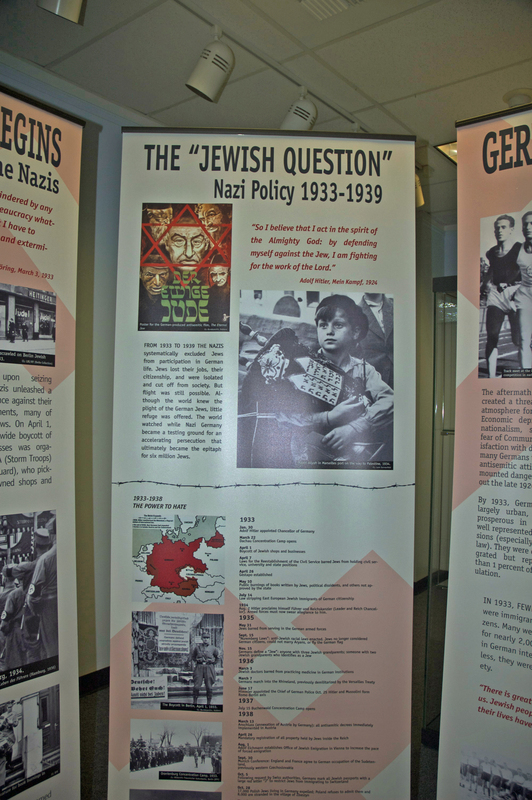 It is one of three identical exhibits, based on the exhibit with the same name in the Museum of Tolerance at the Simon Wiesenthal Center in Los Angeles. These three exhibits will be traveling around California for a year, courtesy of the Foundation of California which received a grant from SNCF (French railway company). The exhibit, which has its own website, consists of 200 photos arranged on 42 panels. 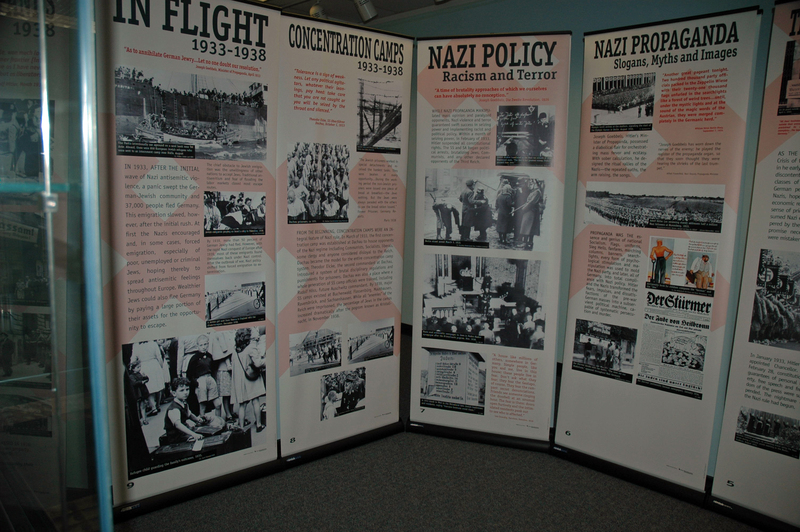 The traveling exhibition was first made available to schools and libraries in California in 1991. I went to see the exhibit at CSUS today. Just as I expected, there were a few controversial photos in the exhibit. The most controversial photo in The Courage to Remember exhibit is the famous photo shown below. 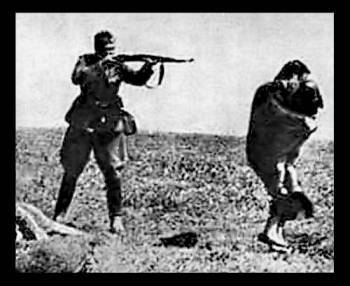 The photo shows a soldier shooting at something that is beyond the woman standing near him, holding a child. 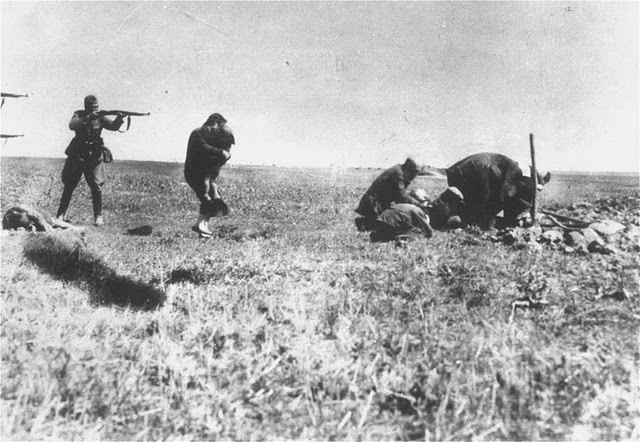 Two rifles can be seen on the far left in the photo, which indicates that there were at least two other soldiers also shooting. Did the exhibit really show the photo above? No, of course not. The photo in the exhibit was the cropped version shown below. In this version of the photo, it appears that the soldier is aiming at a woman holding a child, ready to blow her head off. What is the purpose of cropping this photo to make it appear that soldiers were shooting women and children? There oughta be a law against this! The photo above is from the photo album of Jürgen Stroop, the Commander of the SS troops who put down the Warsaw Ghetto Uprising in 1943. In spite of the fact that the photo above is included in the Stroop Report, which was compiled during April and May, 1943, it was identified by Holocaust survivor Tsvi C. Nussbaum as a photo taken on July 13, 1943 in front of the Hotel Polski on the Aryan side of the Warsaw ghetto, where some Jews had been living as Gentiles. 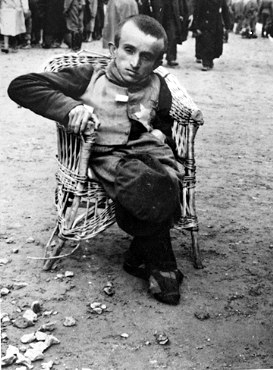 Nussbaum claims that he is the seven-year-old boy in the photo and that the woman on his left is his aunt. 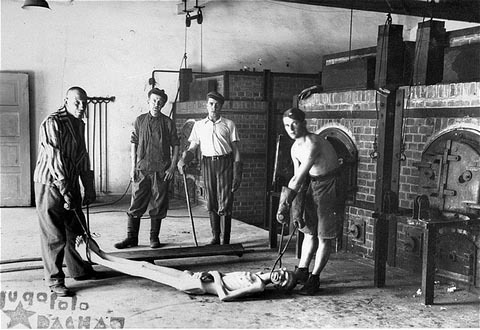 One of the exhibit panels, with the title “Systematic Mass Murder 1942 – 1945,” has a photo of some Dachau prisoners shoving a corpse into one of the ovens in the Dachau crematorium. This is a posed photo, taken by the American military at Dachau, after the camp was liberated. The corpse in the photo is a dummy which was used to illustrate how the bodies were put into the ovens. It is implied in the exhibit that burning the corpses proves “systematic mass murder” at Dachau. 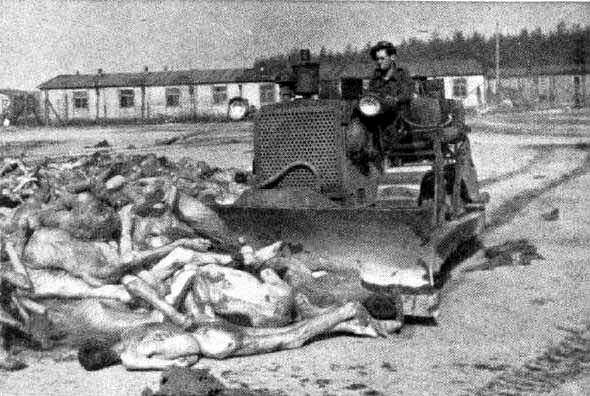 An exhibit panel with the title “Liberation, Unmasking unspeakable horrors” has the famous photo, shown below, of a British soldier driving a bulldozer which is shoving naked bodies into mass graves. On the same exhibit panel is a photo with the caption: “SS guards and Kapos captured at Bergen-Belsen, April 1945.” What is not explained is that these SS guards had volunteered to stay at the camp to help the British after the Bergen-Belsen camp was voluntarily turned over them by Heinrich Himmler on April 15, 1945. They were “captured” after the British broke their agreement with the Germans; the SS men had not volunteered to help the British with the understanding that they would be “captured” and put on trial as war criminals. You can read about the SS guards who were “captured” on my website here. 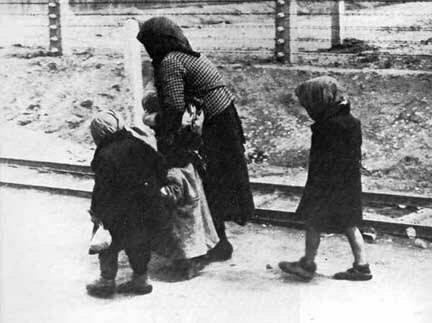 The photo above, which is probably the most famous photograph of the Holocaust, shows a woman and children walking down a road inside the Auschwitz-Birkenau camp. This photo is shown in The Courage to Remember exhibit with a caption which says that the woman and children are “on the way to the gas chambers.” The photo is on a panel which has the title “Auschwitz-Birkenau, Half Hell and Half Lunatic Asylum.” I don’t understand this title, but maybe it means that anyone, who thinks this photo proves that there were gas chambers at Auschwitz, belongs in a lunatic asylum. On an exhibit panel with the title Theresienstadt, the “Model Ghetto” there is a black and white close-up photo of a sign that reads “Arbeit Macht Frei” with the caption: “Work makes Freedom” the cynical sign at Theresienstadt, 1943. The problem is that this sign was not on the Theresienstadt Ghetto where the Jews were sent. 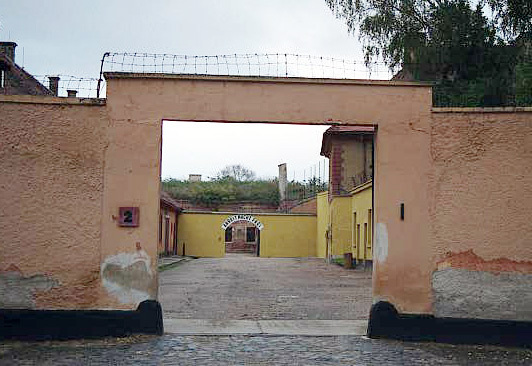 The sign was on the gate into the Little Fortress, a prison for political prisoners that was near the Ghetto. My photo below shows the gate into the Little Fortress. Another panel in the exhibit has the title “The Deadly Philosophy, Racial Purity.” Correct me if I am wrong, but haven’t the Jews tried to keep their race pure for 5,000 years? 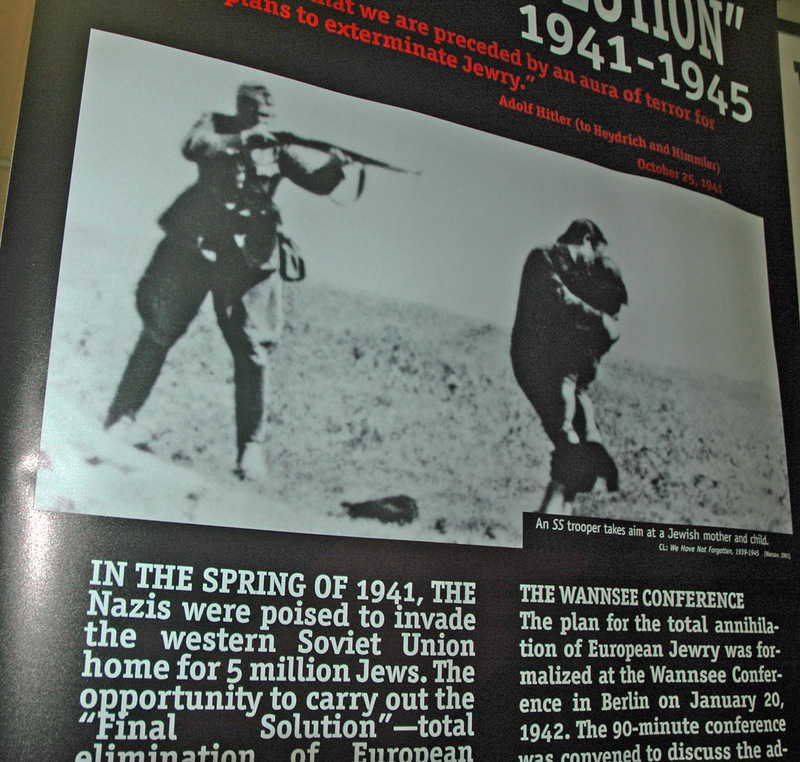 On this exhibit panel is a photo taken at Auschwitz, which is shown below. Dr. Josef Mengele was doing research at Auschwitz-Birkenau to determine the heredity involved in producing a race with deformities, so as to keep the German ethnic group free of deformities. Was that so wrong? In the exhibit, the photo is cropped so as NOT to show the soldiers in the background. 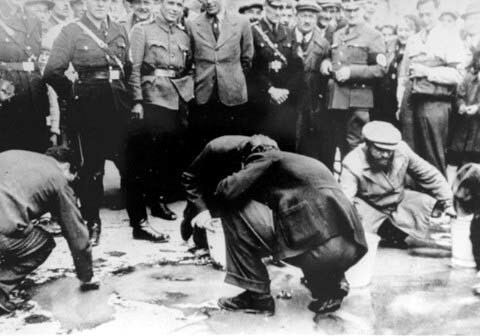 This photograph also hangs in the USHMM; it shows Jews being forced to scrub Schuschnigg’s Fatherland Front slogans off the sidewalks of Vienna after the Anschluss. Would it have killed the organizers of the exhibit to explain what is really going on in this photo? Was there anything in the exhibit that met with my approval? 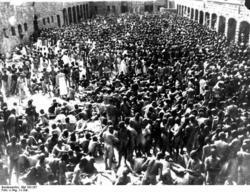 Yes, there was a photo taken in the courtyard at the Mauthausen concentration camp in Austria which had this caption: “Mass delousing of Mauthausen inmates during a typhus epidemic in 1941.” The usual story told about Mauthausen is that the prisoners were forced to stand naked in the courtyard in order to kill them by freezing them to death. The photo is shown below. Photos of the exhibit at CSUS are shown below. An ignominious end to Denis Avey’s fake story? Ken Waltzer is on the case? I predict that the end is near. The Denis Avey book will soon be categorized as a novel, like another fake Holocaust story that Professor Waltzer exposed: the one about the little girl throwing apples over the fence of a concentration camp. I was one of the first to “point out inaccuracies” in the Denis Avey story. Does that make me a “revisionist”? There should be a new term for people who call attention to Holocaust lies. Revisionist is a pejorative term when used by Holocaustians. I blogged about Avey’s book several times, both before and after I read the book. I wrote a review of the book here. The photo above is a still shot of Franz Hoessler (Hössler) who was transferred to the Bergen-Belsen concentration camp after the Auschwitz-Birkenau death camp was abandoned on January 18, 1945. From December 1943 to January 1945, Hoessler had been the Commander of the women’s camp at Birkenau, where he worked with Dr. Josef Mengele, who was the women’s doctor at Birkenau. 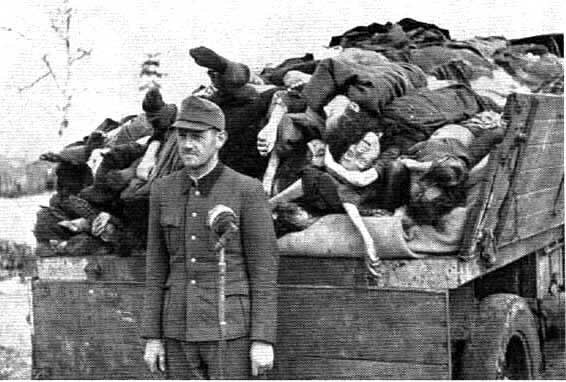 In the photo above, Franz Hoessler is standing in front of a truck loaded with corpses of prisoners who died from typhus at Bergen-Belsen after the camp was voluntarily turned over to the British on April 15, 1945 by Heinrich Himmler. Hoessler was one of the 80 SS men and women on the staff at Belsen who volunteered to stay behind and assist the British. Twenty of these SS staff members died after they were deliberately exposed to typhus. 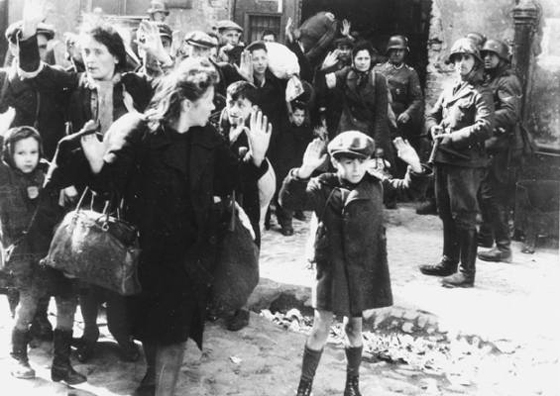 Hoessler was one of twelve SS men and women, who were put on trial by the British in The Belsen Trial in 1945, and charged with crimes committed at both Belsen and Auschwitz. He was convicted of war crimes committed at Birkenau, including his alleged participation in the selection of prisoners to be gassed. This morning I read an article in a college newspaper about a traveling Holocaust exhibit that was recently shown at California State University Fresno. Holocaust survivors were on hand to tell the students their personal stories. Among the survivors, who attended the opening ceremony of the Courage to Remember exhibit from the Museum of Tolerance, were Anna Levin-Ware and her husband Robert Ware. Photos of Anna, taken when she was a prisoner in the Auschwitz-Birkenau death camp, were included in the exhibit. Later Levin-Ware shared how she was placed in a gas chamber, doors locked, ready to die. Then, suddenly, guards suddenly opened the doors and announced that any Hungarians were to leave, including her by marriage. To her surprise, they removed her from the chamber. But to her horror, they left her father, mother, brother and baby sister in the gas chamber and could only listen as the sounds of panic slowly became silent, marking their deaths. Along with other parts of her story, she showed the audience a picture of her assembled before the Nazis of her camp when she was in her 20s. I was very pleased with the first episode of Two and a Half Men in the new Season 9, which was on last Monday night. It was much better than I was expecting. The sitcom broke records with 27.8 million viewers, as people tuned in to see how the show would manage without Charlie Sheen, who was fired last season. Ashton Kutcher played the part of a new character and he did quite well. I was impressed with his good acting performance; he fit right in as though he had always been one of the characters on the show. Kutcher did not replace Charlie’s character, Charlie Harper. No one could ever replace Charlie Sheen, nor his character, Charlie Harper. The best part about the new show is that there is a possibility that Charlie Harper could come back. I’m not sure if the producers of the show realize that they have left a way open for the return of Charlie Harper. The first show of the new season starts off with the funeral of Charlie Harper as his wife Rose tells the mourners about his death: he fell off a train platform in Paris and was hit by a train. This happened just after he had told Rose that he had been unfaithful. It was strongly implied that Rose had pushed him off the platform. His body was cut into hamburger meat. A coffin was shown at his funeral, but his remains were not in the closed casket. So how do we know that Charlie is really dead? We don’t! Rose is a known liar and as regular viewers of the show know, Rose cannot be trusted. Maybe she pushed him, maybe he fell, or maybe Rose was lying. Later in the show, Charlie’s brother Alan is carrying Charlie’s ashes in a large urn when the new character, Walden Schmidt, shows up at Charlie’s Malibu beach house where Alan and his son still live. At that moment, Alan spills Charlie’s ashes inside the house and they are cleaned up (off camera) with a hand vacuum cleaner. Presumably the hand vacuum cleaner is emptied into the trash and Charlie is now completely gone. Gone but not forgotten! Charlie Sheen has millions of fans and if he should return, it would bring even more viewers to the show. It would be easy to have a plot twist in which it is revealed that Rose was lying about Charlie’s death. Did someone really pick up all the tiny pieces of Charlie’s body after he was allegedly hit by a train? Was a DNA test done to make sure that it was Charlie? Did this really happen at all, or was Rose lying? In the news today: dragging a man to death…Where have we heard this before? There were three white supremacists involved in the crime; Brewer is the first of them to be executed. When I read about this, I wondered where these three men had gotten the idea of dragging someone to their death behind a truck. I think that the fact that they were white supremacists gives us a clue. As white supremacists, they were undoubtedly familiar with crimes committed against the Germans during World War II. There is a famous story of a German SS soldier being dragged behind a truck by members of the French Resistance during World War II. There were 100 cities across America which had their own local memorial ceremony for the 10th anniversary of 9/11 on Sunday, September 11, 2011. The 9/11 Memorial day in Sacramento, CA featured a field of Empty Shoes precisely arranged on the grounds of the State Fair Grounds. 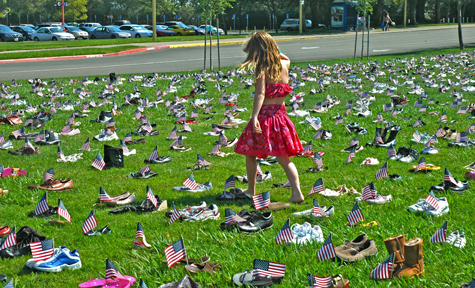 The empty shoes were in honor of the 2,977 people who died ten years ago on 9/11, including 2,349 civilians. The field of empty shoes consisted of new shoes, of all kinds, which were donated by people in the Sacramento area. The shoes were given to the Salvation Army when the Memorial was taken down. On Sunday, September 11th, I watched the 9/11 Memorial ceremonies on Fox News all day. Memories of 9/11 ten years ago came flooding back: On that day, I had gotten up at 6 a.m. as usual (9 a.m. Eastern time) and immediately turned on the TV set in my bedroom. I was horrified to see the South Tower at the World Trade Center with a gaping hole in it and black smoke pouring out. The tower had been hit by American Airlines Flight 11 at 8:46 a.m. Eastern time. I thought at first that the plane had hit the tower accidentally. As I watched in horror, at 9:03 a.m. Eastern time, I saw the North Tower hit by Flight 175. A big red ball of fire appeared on the opposite side of the tower and I knew that this was a deliberate attack: World War III had started. I expected that attacks in other cities would quickly follow. I called my daughter, woke her up, and told her not to go out of the house because we were at war and anything could happen.